Tooth loss can have negative effects on more than just your smile. Living with missing teeth can dramatically impact your confidence, self-esteem, and social life. Fortunately, Dr. David Pousson can place dental implants at his Slidell, LA, office. 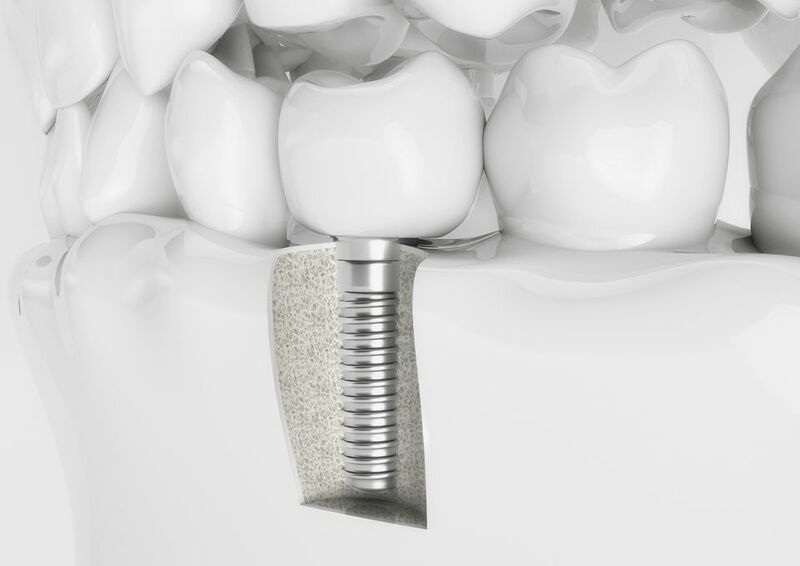 Dental implants are small titanium posts surgically embedded into the jawbone to permanently serve as tooth roots. A custom, natural-looking restoration is then placed on the implant post to complete a healthy, attractive smile. Does Tooth Loss Affect My Health? Tooth loss is detrimental not only to your oral health, but also your general health. An incomplete dentition or uncomfortable conventional dentures prevent a healthy diet high in fiber and protein. Soft diets high in carbohydrates might be satisfying, but are terribly unhealthy. Investing in implants can allow you to enjoy your favorite food, smile with confidence, and look your best. The dental implant procedures can be conveniently completed from start to finish at Pousson Family Dentistry. This makes our patients feel comfortable during the process, as they become familiar with our staff who will see them through every step of treatment. Enjoy years of restored oral form and function, as well as a natural-looking smile, with dental implant-supported restorations. Dr. Pousson will review your dental and health records, review a list of medication you are currently taking, perform a thorough dental exam, and take x-rays of your teeth, gums, and jawbone, to determine your candidacy. You will receive an easy-to-understand written comparison of your treatment options with advantages and disadvantages of each. This will help you understand all of your options and pick the one that is best for you. Dental implants are the most versatile treatment in dentistry. They can replace a single tooth, multiple teeth with a bridge, support and anchor removable dentures, and much more. You can also use dental implants to prevent jawbone degeneration, which can lead to a sunken appearance and other oral complications. With proper care, a dental implant can last the rest of your life. When comparing the cost of a dental implant to other restorative options, it is imperative to consider the longevity they offer. When you invest in dental implants, you are also investing in your quality of life. Living with missing teeth can be detrimental to your confidence. Patients consistently tell us that after receiving implants, they smile more than ever, their social life is improved, and their confidence is revitalized. Care for your new teeth and gums the same as you would for natural teeth. Although implants will never decay, it is important to maintain a strict oral hygiene routine because your gums are still susceptible to periodontal disease. However, regular brushing and flossing, combined with routine checkups, can significantly reduce your risk for oral complications. When placed by qualified experts such as Dr. Pousson, you can expect your dental implants to last a lifetime. Keep in mind that the success or failure of your dental implants depends largely on your commitment to oral hygiene. Here at Pousson Family Dentistry, we want to help you smile confidently. Whether you have one missing tooth, or several, Dr. Pousson can place dental implants that can dramatically improve all aspects of your oral health. Implants are an all-encompassing restorative and, ultimately, cosmetic dental procedure that offers unrivaled benefits. To learn more about this procedure, including costs, surgery, and related treatments, contact our office ... we'll give you a reason to smile!